In my time with PUPI, formally known as Private, Unaffiliated Paranormal Investigations, I've seen a lot. Learned a lot. And not all of it's been good. But what we do--make people accountable for crimes committed with magic--is important work. Still. Even I need to take a break every now and again. Or so I've just been told (ordered). So hey, vacation. Maybe I'll finally figure out what's going on with the "special bond" between me and the boss man, Benjamin Venec. Venec seems to like that idea--he's invited me down to join him on a jaunt to Philly. But no sooner do I arrive in the City of Brotherly Love than we're called in to look at a dead body. 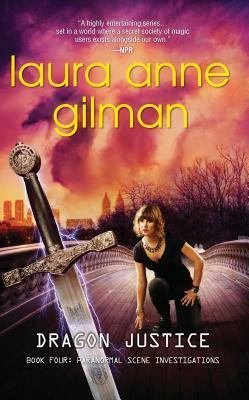 Laura Anne Gilman is the author of the popular Cosa Nostradamus books for Luna (the Retrievers and Paranormal Scene Investigations urban fantasy series), and the Nebula award-nominated The Vineart War trilogy from Pocket, as well as the YA trilogy GRAIL QUEST for Harper. Her first story collection is DRAGON VIRUS andshe continues to write and sell short fiction in a variety of genres. Follow her at @LAGilman or www.lauraannegilman.net"
"Layers of mystery, science, politics, romance, and old-fashioned investigative work mixed with high-tech spellcraft."